SMOOTHES EDGES, REPLENISHES MOISTURE, ADDS SHINE! SMOOTH STYLING FOR DRY, DULL OR BRITTLE HAIR. Water (Aqua), Ceteareth-25, PEG-7 Glyceryl Cocoate, Glycerin, PEG-7 Hydrogenated Castor Oil, Macadamia Ternifolia Seed Oil, Honey Extract, Aloe Barbadensis (Aloe) Leaf Juice, Rosemarinus Officinalis (Rosemary) Leaf Extract, Urtica Dioica (Nettle) Extract, Humulus Lupulus (Hops) Extract, Equisetum Arvense Extract, Lawsonia Inermis Extract, Anthemis Nobilis Flower Extract, Symphytum Officinale Rhizome/Root Extract, Caprylyl Glycol, Hexylene Glycol, Cocodimonium Hydroxypropyl Hydrolyzed Wheat Protein, Ethylhexylglycerin, Phenoxyethanol, Fragrance (Parfum). Ingredients may vary. Get a festival look that’s fit for a festival queen; that’s you! Fabulous Joyjah turns the oldest hairstyle—a ponytail—into a glam leather-adorned Ponytail with golden hardware. 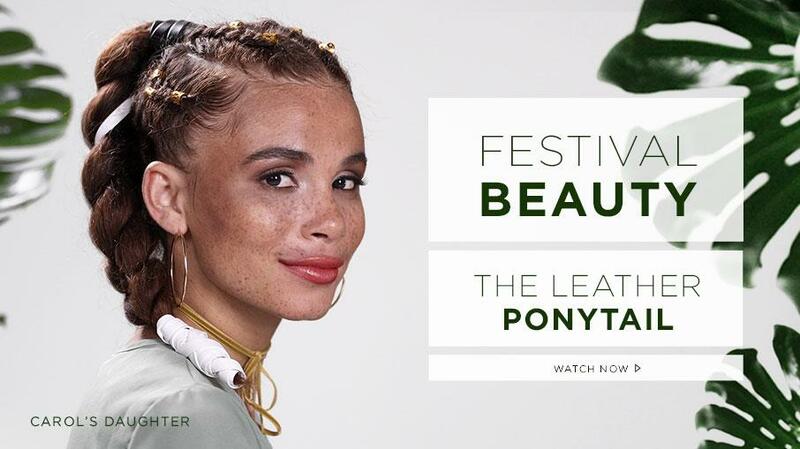 Watch and see how easy you can create this festival-ready look with your natural hair using our haircare essentials like Cupuacu Anti-Frizz collection, Marguerite’s Magic and our Black Vanilla Edge Control Smoother. This is the perfect go-to hairstyle for any festival, just braid in a piece of leather ribbon—and you’ve designed a Festival look that’s Instagram-worthy. Not only does it give your natural hair an easy style, it works on all curly hair. Add in some glitzy hardware, and you’ve got the perfect style for any art or music festival. Watch now to create your own chic ponytail look.